What is a truck rate calculator? A truck rate calculator is a tool used by truck owner operators and trucking companies. It’s primary purpose is to determine if transporting a load will be profitable or not. The truck rate calculator integrated into our trucking software does an exceptional job calculating all load expenses and determining a profitable rate. How does the truck rate calculator work? You enter your fixed expenses for one month. They only need to be entered once unless the amounts change. You enter the expenses of transporting the truck load such as fuel price, driver pay, broker fees etc. Our truck rate calculator provides you with all the financial details of transporting the truck load. Subscribe to the truck rate calculator today! No Contracts! Our truck rate calculator examines your fixed expenses and variable expenses when calculating the profitable rate for each truck load. Fixed expenses are expenses that are the same each month such as rent and insurance. The total fixed expenses is then divided by the number of truck loads transported each month. The resulting number is your fixed expense per load. Variable expenses are the expenses related to transporting the truck load. Variable expenses include fuel price at the time of transport, number of miles per gallon for the transporting truck, distance in miles from the origin to the destination, driver’s pay, broker fees and more. In addition to capturing variable load expenses we also capture them in the format that you typically have to work with. This means that the truck rate calculator will let you enter some expenses such as driver’s pay and equipment rental as either a flat rate expense, a per mile expense or a percentage of the load value. The truck load calculator then asks you for the transport rate you were offered or you can enter the transport rate you believe the load is worth. If you know of the net profit amount that you would like to receive after all expenses simply enter it into the truck rate calculator and your desired net profit will be included in the truck load rate calculation. The quickest way to see an example of a truck rate calculation is to view the screenshots of the truck load calculator. Click here to see the truck load calculator input screen. Click here to see the truck load calculator output screen. Our truck rate calculator starts saving you time the minute you start to use it. The first step is to enter the origin and the destination. You can enter the destinations by city and state or by zip code. The distance calculator will automatically populate the distance field with the total miles from the origin to the destination. You are able to edit the distance field to change the mileage if necessary. You are able to view and modify your fixed expense per truck load, if necessary. Our trucking software asks you for your fixed expenses once. Since they are fixed expenses there is no need to modify them with each truck rate calculation. While entering your truck load expenses you are able to see your fixed expense per truck load. Simply click the link to edit your fixed expenses if a fixed expense changes or the number of loads you transport per month changes. Next you enter the miles per gallon for the transporting truck, fuel price per gallon, driver’s pay, loading fees, broker fees, permit fees, equipment rental fees and other expenses. The broker fee, permit fees, driver pay, equipment rental and other expenses can be entered as a flat rate, a percentage of the truck load rate or as a per mile rate. Once our truck rate calculator work it’s magic you are presented with a report of valuable information about the finances related to this truck load. You will instantly know how many gallons of fuel will be required to transport the load as well as the total fuel cost. Broker fee, permit fees, driver pay, equipment rental fee and other expenses are converted to a flat rate dollar amount even if it started out as a percentage of the load expense or a per mile expense. You are given a total expense dollar amount that includes all fixed and variable expenses for your truck load. Of course the truck rate calculator results include a cost per mile dollar value. The bottom of the truck rate calculator results display the rate you were offered to transport the load and compares it to the expenses of transporting the truck load. You quickly see the rate per mile, total profit if you transport at the offered rate and the percent of profit in the offered transport rate. Next to the offered rate data is the profitable rate data. The profitable rate will include all expenses plus your desired net profit if entered. If you don’t enter a desired net profit then the calculator will create a net profit on its own. Please keep in mind that the profitable rate is only a suggestion. Only the business owner determines the final rate to transport a load. 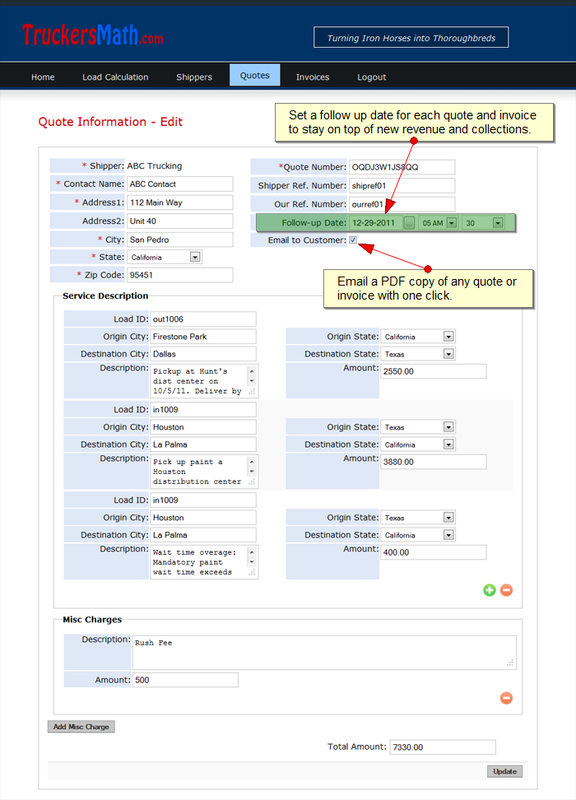 When your finished reviewing the truck rate calculator results you will have the option to add another leg to your trip, create a quote or to create an invoice. You can create a quote from your calculations. The quote can be emailed to the shipper from our trucking software. 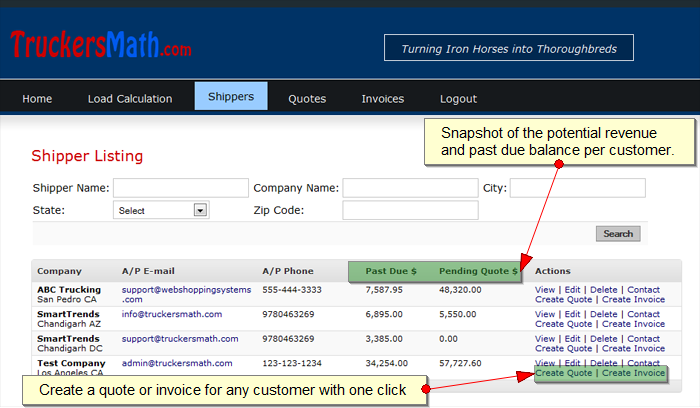 Later, the quote can be converted to an invoice with the click of a button. All data is transferred to the invoice. You only need to add any miscellaneous expenses and to check the total. The invoice can be emailed to your customer at the time of creation if you wish. Click here to subscribe to our trucking software which includes our truck rate calculator. 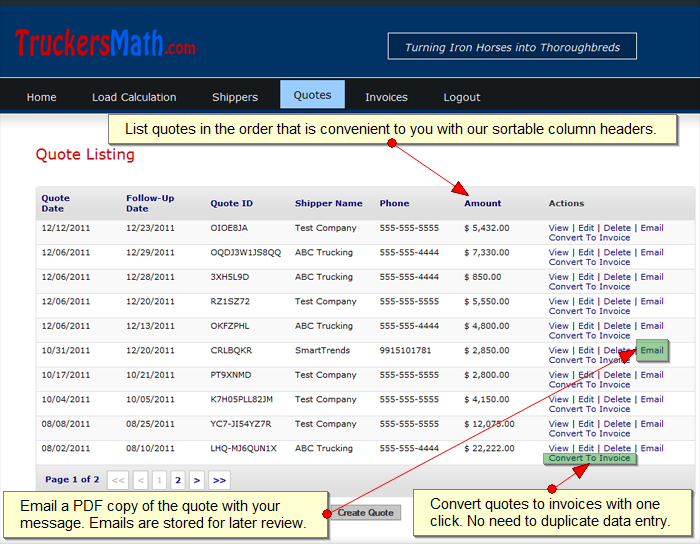 You can create quotes from truck rate calculator results or manually. If you create a quote from a calculation then all of the data from the calculation will be transferred to the quote form saving you valuable time. The quote number is a random number that you can change to suite your needs. See the screenshot below for more details.